Cathay Pacific’s check-in was near the South Wing of Hong Kong Airport immigration, at aisle B. 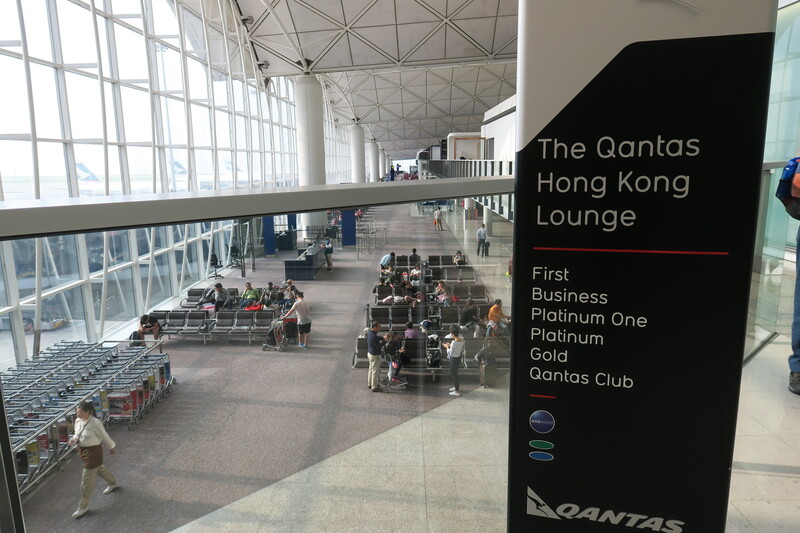 We entered through there – on the plus side, there are less people, but on the other hand I was aching to revisit the Qantas Lounge, which is my second favourite lounge at Hong Kong Airport. That’s located right past the North Wing of immigration, so I had to take the trek across the terminal back there. 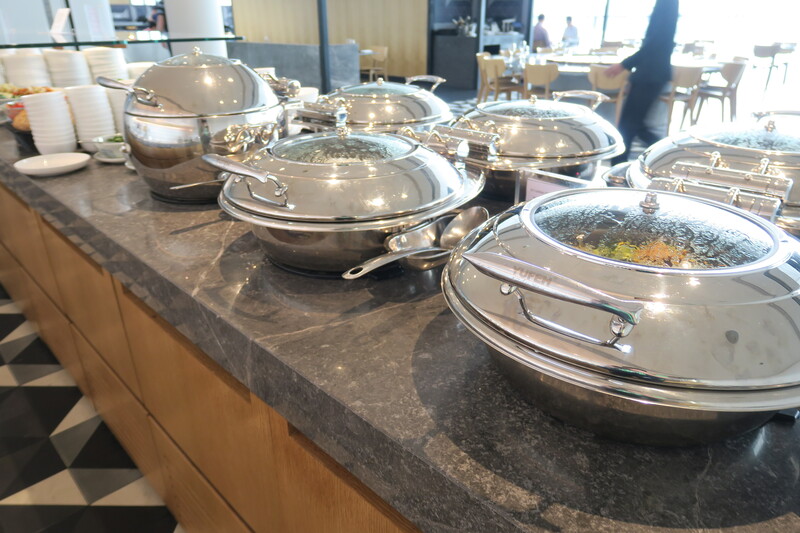 Keep in mind that the Qantas Lounge Hong Kong is a oneworld business class lounge, so apart from status, you can get in the lounge with basically any oneworld carrier. 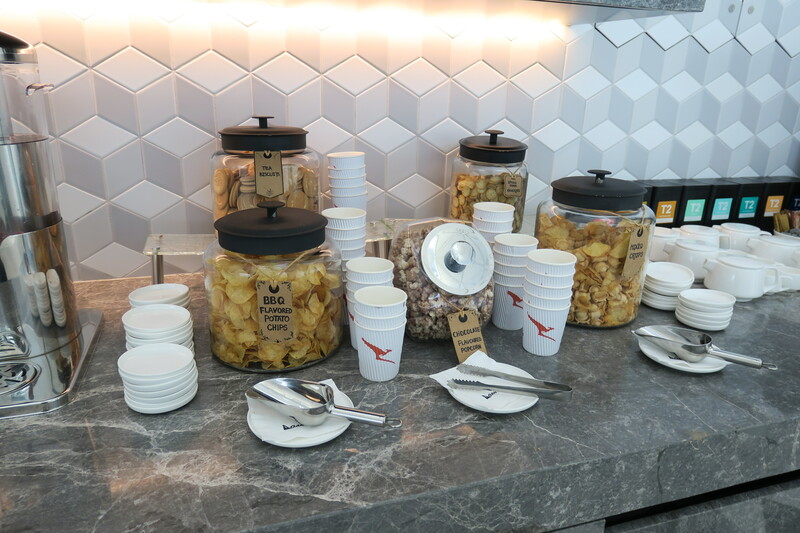 I’m assuming that with Emirates’ partnership you can also visit the Qantas Lounge flying Emirates first or business class, though I’m not sure about that. I went past the hallway that runs past the side of the 7th floor, and made my way into the lounge, where I was quickly allowed in by the lounge attendant. I walked into the lounge, where there was an initial seating area with comfortable lounging chairs resembling a coffee shop. I’ve talked about the lounge before in a previous review, though I would like to revisit the lounge with better quality pictures. The lounge is downright gorgeous. It’s bright, airy, the “bare concrete” floors are amazing, and the layout is spacious. 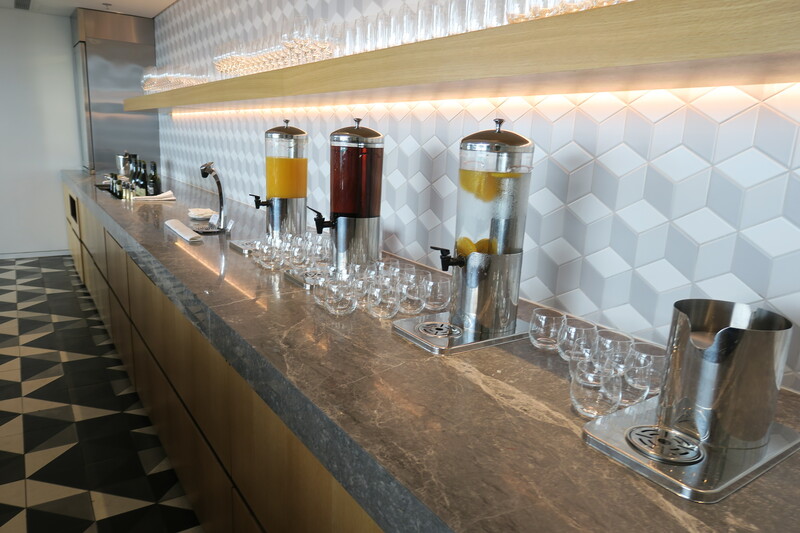 It’s not nearly as luxury home-style as the new Cathay Pacific The Pier lounge, but it’s definitely more modern. 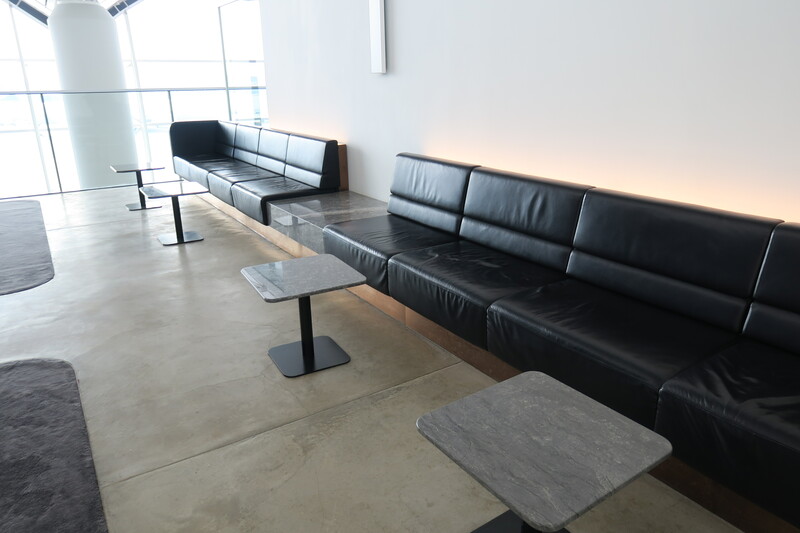 The lounge features an extensive amount of seating, a buffet, and a bar, all of which have phenomenal designs. The entrance also featured a departures board with all flights, so suffice to say it wasn’t very helpful, as the display only showed a few flights per rotation. I first walked behind the bar past another seating area, lined with similar colours as the bar – black and white, modern hues, with supposedly-Oriental style lamps above. To the right of that was a picture of the Hong Kong skyline, which just added to the “modern rustic” feel of this area, which I loved. I then had a quick visit to the bar (I came back later, but I’ll talk about it now). This wasn’t my first time at this bar, though it was my first time eating there. I’ll talk about the food later and focus on the aesthetics now. I think that the actual bar is brilliant. It’s not exactly Oriental-themed like Qantas first tried to strike, though I’d argue this looks even better. I like how modern and upmarket the bar looks, something a lot of lounges don’t strike. While there’s action at the entire bar, as a non-alcoholic soda drinker the place to be was by the end, where there’s literally seltzer water on tap. Each seat at the bar is set up as if it were fit for an upscale Chinese (fusion) restaurant, complete with a wine cup, a napkin and chopsticks. 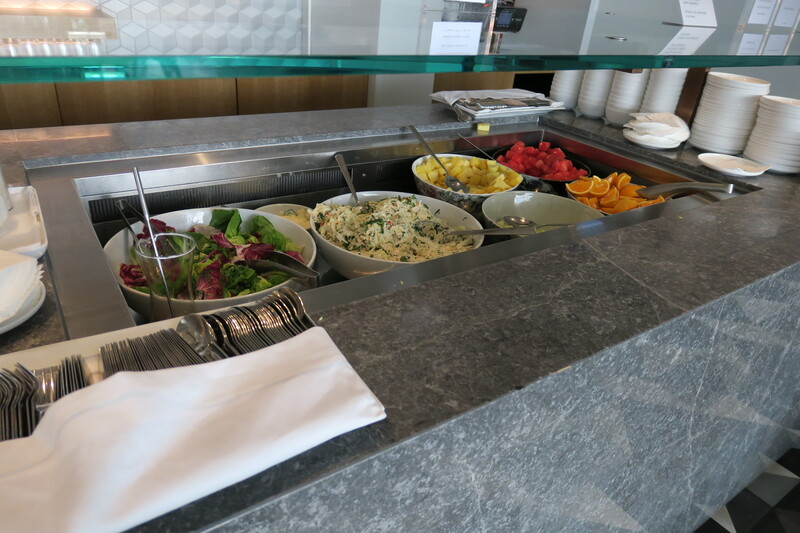 Obviously there’s a knife and fork as well if you ask the bar for it – unlike what you’ll get at some Cathay Pacific lounges, everyone at the bar is incredibly nice and helpful. As you can hint out at in the above photos, there was also an “indoor” nook for larger groups. 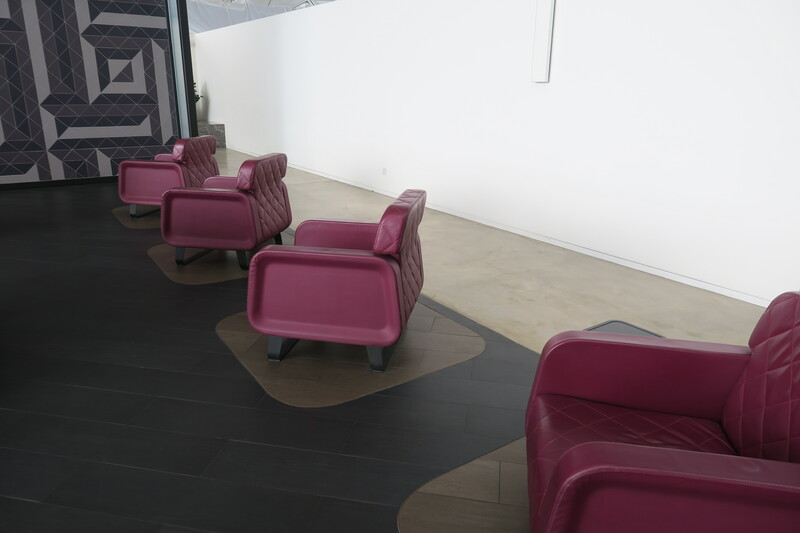 It’s not really intended to be a quiet zone, which this lounge doesn’t really have, since it’s entirely open-air – but it is a creative space, considerably quieter and is fully equipped with power ports. Past the nook was a partition introducing yet another seating area. As myself, as well as other reviewers have noted, the lounge is amazingly big for an airline with a few flights out per day. 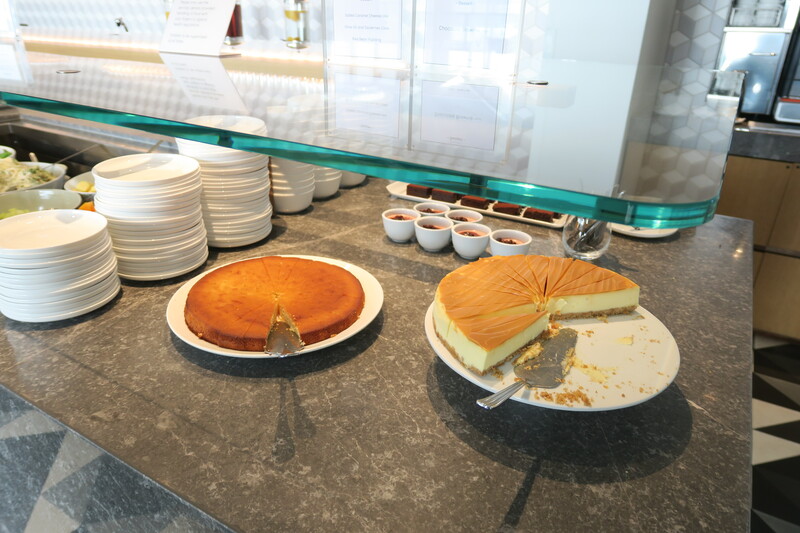 It’s almost like the lounge was built for Qantas’ oneworld partners. There was “wallside bar seating”, which isn’t my favourite type of seating, and I don’t seem to be the only one, as the wallside bar seating in the entire lounge was constantly empty. 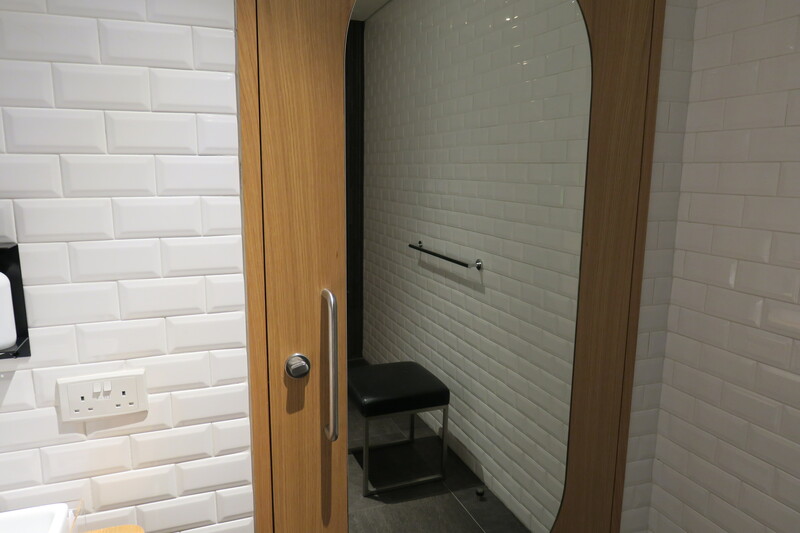 While they do have back support and one power port per chair, so do the comfier armchairs around the area, and it’s not like the lounge ever fills to full capacity. I do like the fact that they have the option, though. 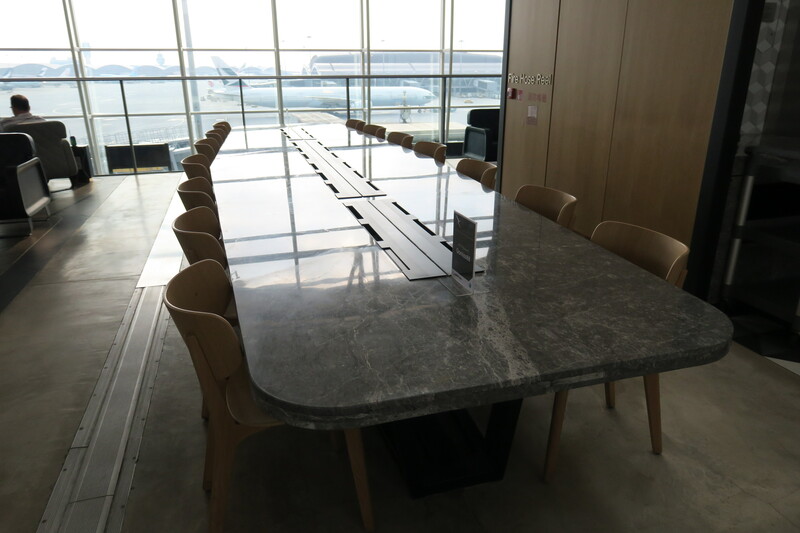 There was more dining seating, including communal tables and tables for two. If I was on a later flight I’d be in for the “plate of the day”, which can range from steak, to fish, to something else altogether (I’ve heard amazing things about the plate of the day, but I’ve never been in the lounge late enough for it). 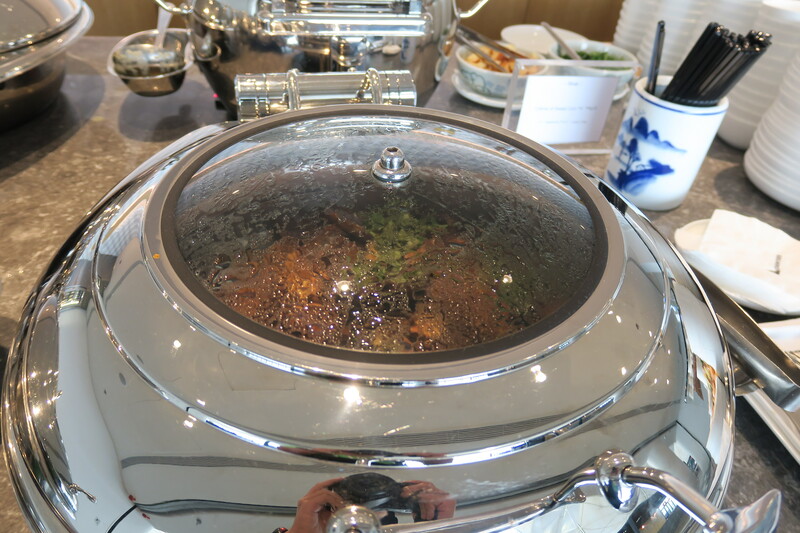 I know that whilst their signature char siu dish (more on that later) is available anywhere in the lounge, dim sum and the plate of the day is only offered if you’re at the tables, though. As someone who (blindly) aspires to be a head chef sometimes, if you cut out the “restaurant” part of the lounge, I’d be super intimidated because of how HUGE it is happy to run it as a separate flagship restaurant. 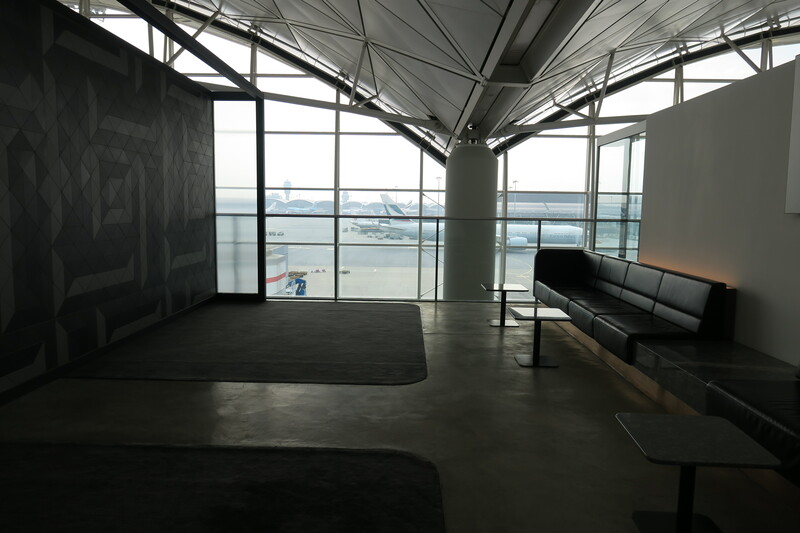 Being a concourse-level lounge at Hong Kong Airport it goes without saying that during the daytime the lounge has some of the best views. I even had a good view of a Lufthansa A380 at one point, which I’m excited to get on next February. Past one point was the entrance to a part of the lounge which is only open for a certain amount of time, so it was actually my first time entering the “rear” end of the lounge. I went through the “door”, which had one of those lanterns laced around the lounge in anticipation of mid-autumn festival. Past the second area was yet more seating, which included some wallside bar seating, a lot of couches and some more configurations that we had yet to see. I mean, would you really want to sit on one of these open benches, especially since the lounge is maximum 10% at capacity? I guess this “they do it not because they have to, but because they can” attitude is purely based off their new partnership with Emirates. The “main seating” that’s actually built for comfort, though, is still there, and in large numbers. 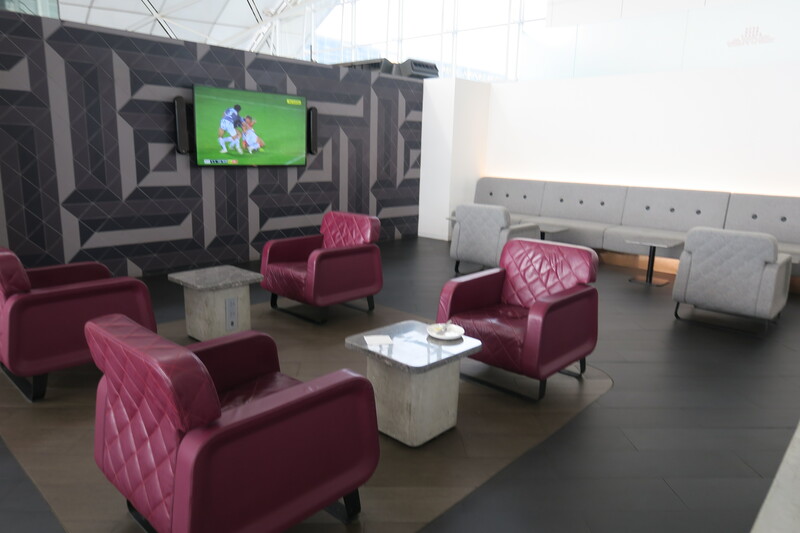 While there’s a lot of amenities in the first half of the lounge, the second half is purely seating. There’s no way the lounge can ever pass a third of its capacity, ever. 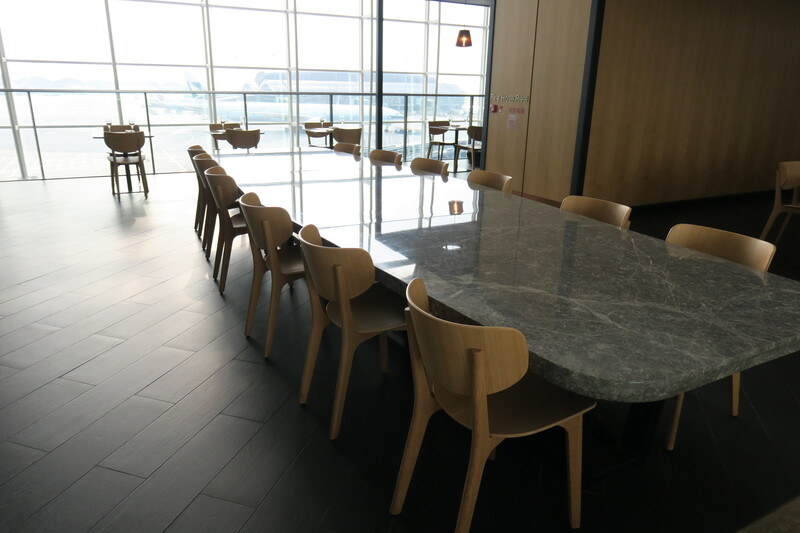 There are a few “secluded” benches near the end, which may be sat on if there’s ever a large group in the lounge (bench seating is rarely ever comfortable, and it’s not like it’s a restaurant area either, but at least there are tables to work from). There was more communal seating with their very own power ports, which I always appreciate, as they’re actually useful for longer meetings. There’s a main food spread in the first half of the lounge I’ll cover later, but the “rear” end of the lounge isn’t purely forgotten. 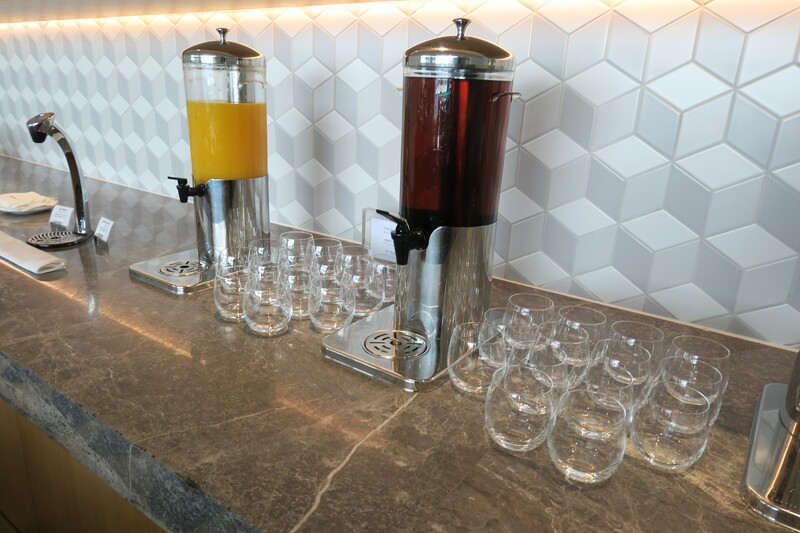 You still have orange juice and a few biscuits, as well as wine (there’s a coffee machine, but it’s not like real barista service at the bar is that far of a walk away). 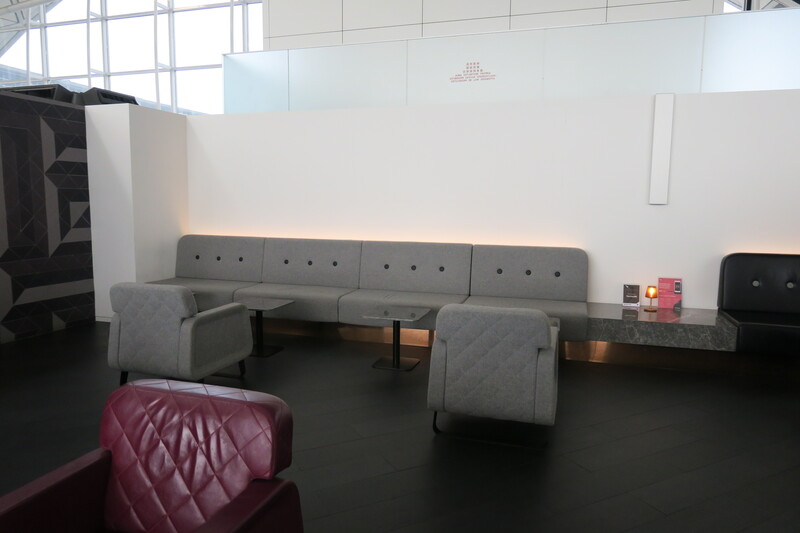 I went to the very end of the lounge, and found more bench seating (this is secluded bench seating, so since the lounge doesn’t have daybeds, it makes sense, as people with long layovers can sleep here – it makes less sense in broad daylight by the walking aisle). I assume the area next to that is a children’s play area, though the toys are certainly BYO. There is a nice flatscreen TV that can be watched from there, though. 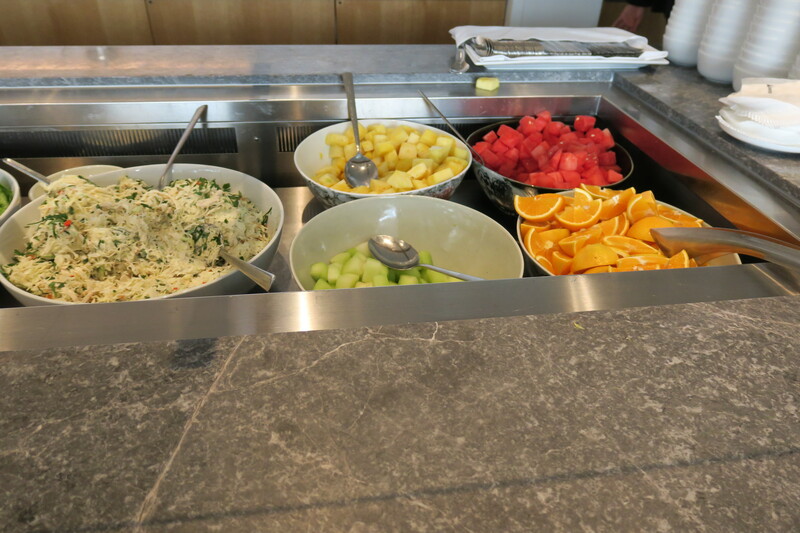 One reason I came back to the Qantas Lounge Hong Kong was to revisit the lounge’s food options. 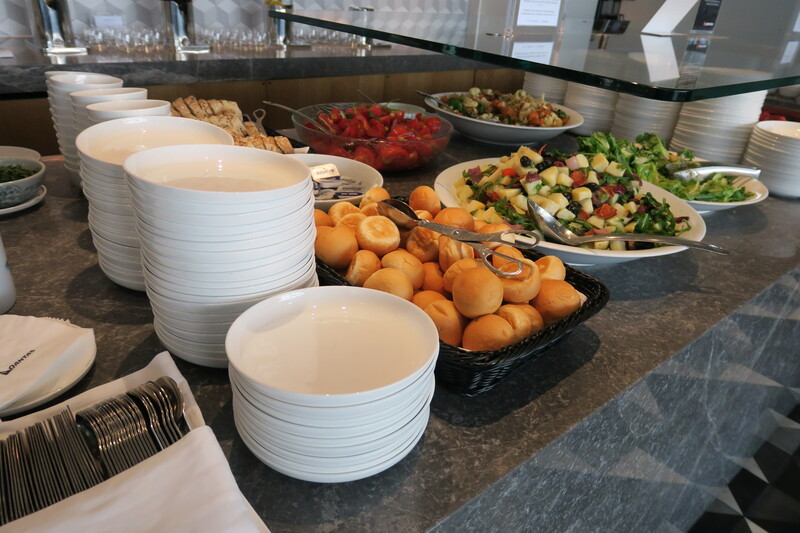 From the buffet, the lounge had several hot options, all of which were great. 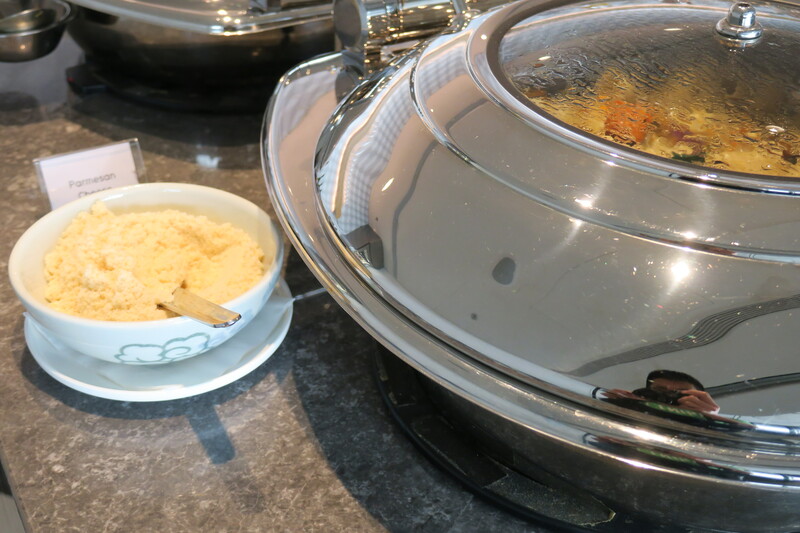 I can’t quite remember what I got, but it was certainly an infused rice, some chicken and a spinach cannelloni, as well as corn soup with croutons. I do remember enjoying all the food I got, though. Even if you don’t want hot food, you’re spoilt for choice. 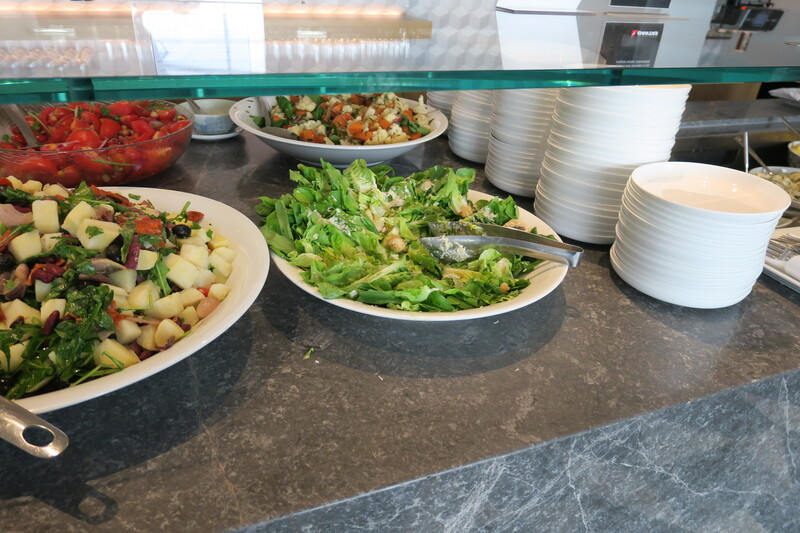 There were multiple salads, pastries and desserts. I was more concerned about the amount of food that went to waste every night than everything else. Man, even looking at the food, my mouth is salivating right now. I’m not sure of the point of the drinks section given that there’s an entire bar right across the area to your disposal, but there’s always the option if you just need a drink real quick. I’m not sure of the point of the coffee machine, though – you literally have the bar to your disposal, which offers barista service, and it can’t be that much slower than this machine. I sat by the bar with my food, so I could have a little look at how it was going by the bar. The bar manager was really hospitable, and asked me if I wanted a drink. I asked him if they had any mocktails. He said “of course!” and recommended a fruit punch, but I wasn’t in the mood for that. He also had an Asian fruit punch on the menu, including lychee, ginger ale and a few other ingredients, which sounded really nice, so I went with that. The soda water in the drink was straight out of the soda water tap they had. He also asked me if I wanted to try their signature char siu rice. Who was I to turn that down? After all, I hadn’t had a proper, non-packaged char siu in what seemed like forever. He brought that out in ten minutes or so, and I loved it. 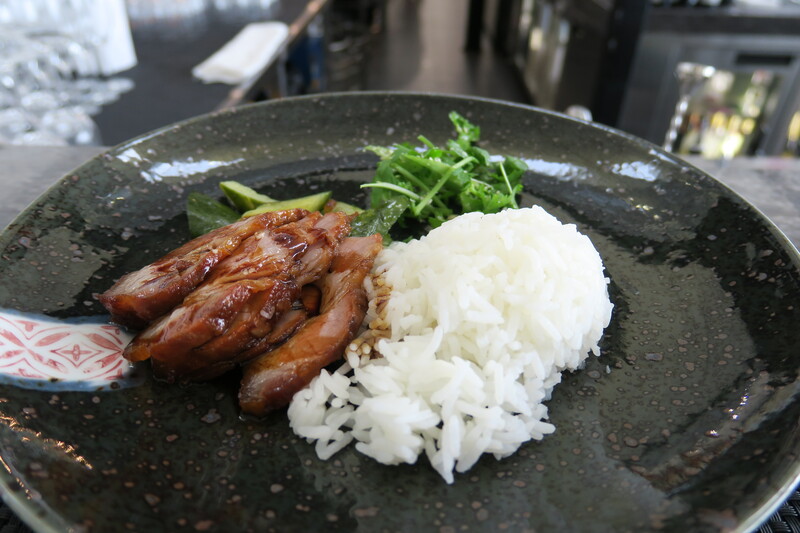 The pork melted in your mouth, the rice was perfectly cooked and well seasoned, and the sauce was equally amazing. I didn’t really know what to do with the pickled sides or the cilantro on the plate, though. 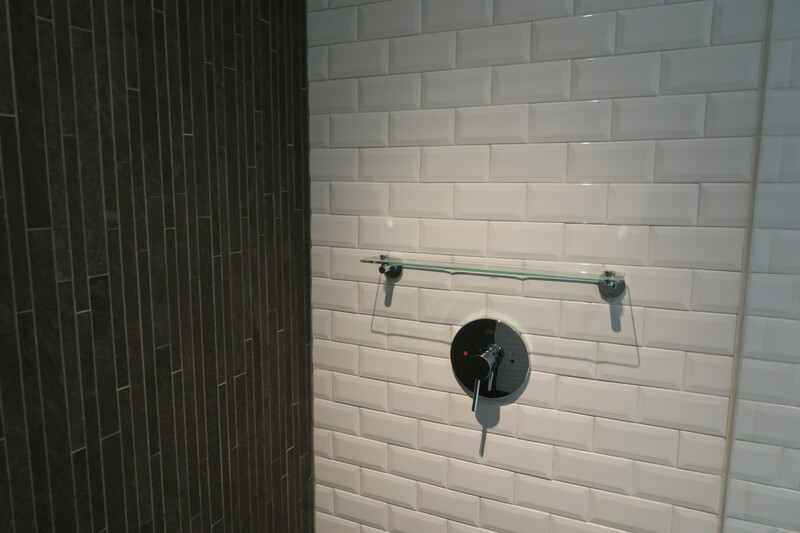 There was one last thing I needed after a long day at school – a shower. 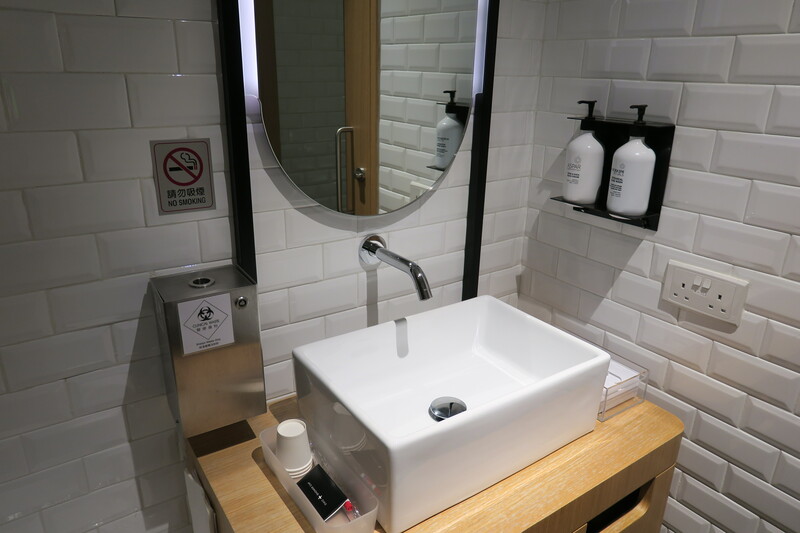 Out of the four lounges, I decided this would be the most appropriate time to shower, as I wanted to spend the majority of my time here anyway (I was just in the other three for quick picture tours). 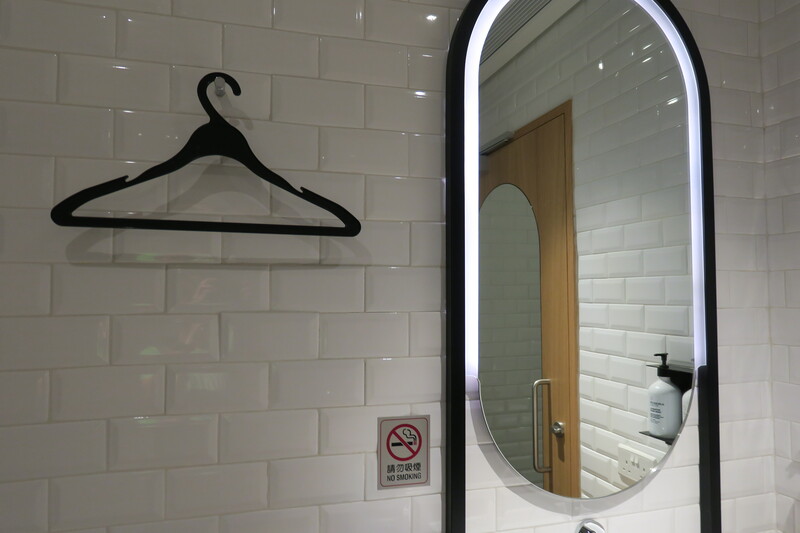 The shower attendant wasn’t as nice as the last time I visited, but was still gracious and quick on giving me a shower room. 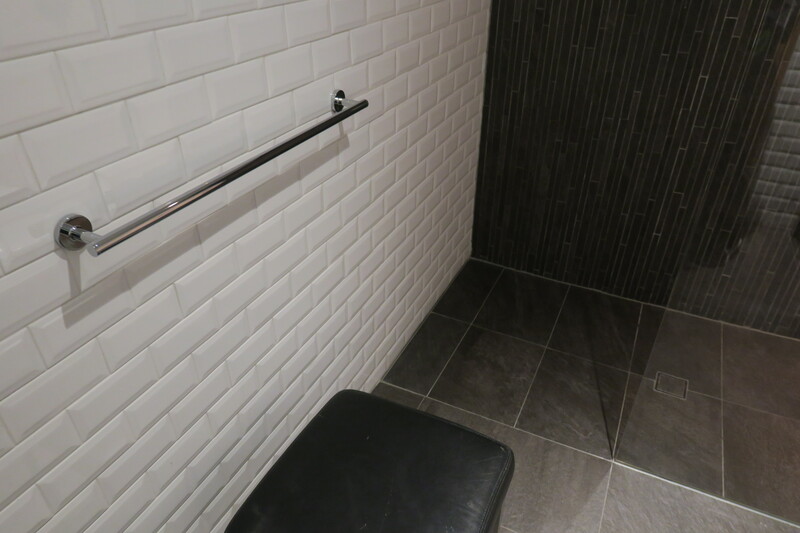 The shower rooms are extremely well appointed – they’re not dripping in gold, but they’re modern and decorated with stylish restraint. The actual shower area was bigger than I remembered it to be, though my one critique is that if you were to spend a long time in the shower, there wasn’t anything stopping water from flowing out into the bathroom. 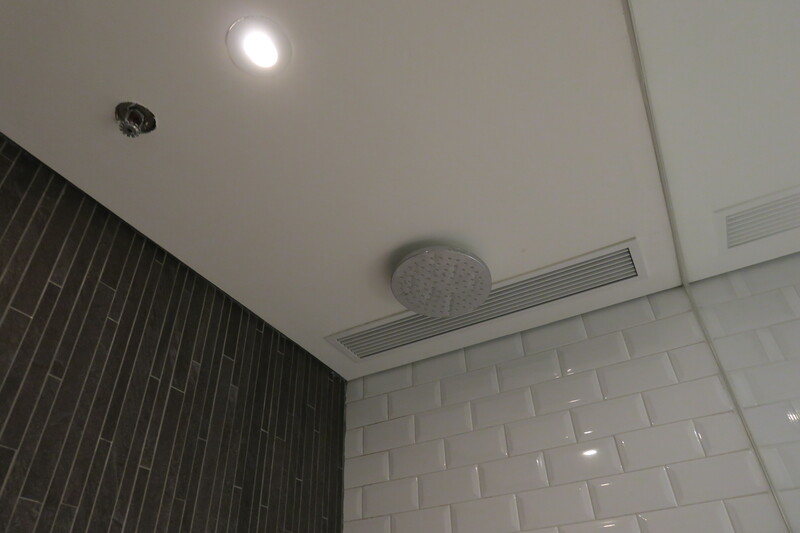 The shower head worked, though, and was fantastic. There was only one rainforest showerhead, though that’s fine with me. Water pressure was excellent, which was nice. 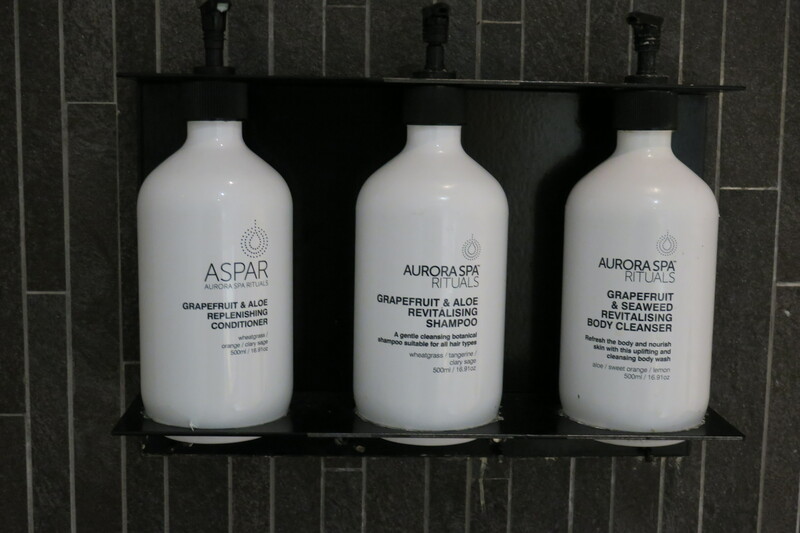 The shower rooms all feature Aspar toiletries. 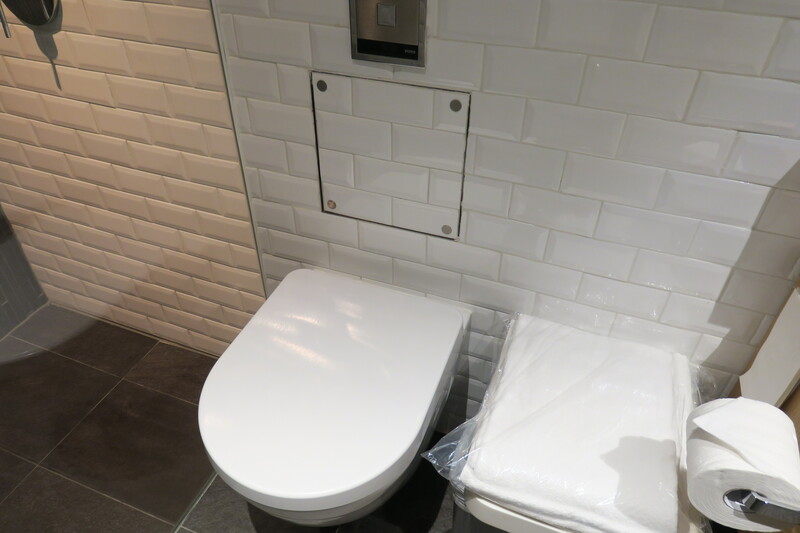 I mean, the shower rooms even have power ports – what more could you want? It’s worth noting that the last time I came in the lounge I actually had a nice talk with one of the lounge attendants. It’s worth noting that the bar attendant was the only staff member I had interactions with, though he was still one of the warmest lounge attendants I’ve ever had. 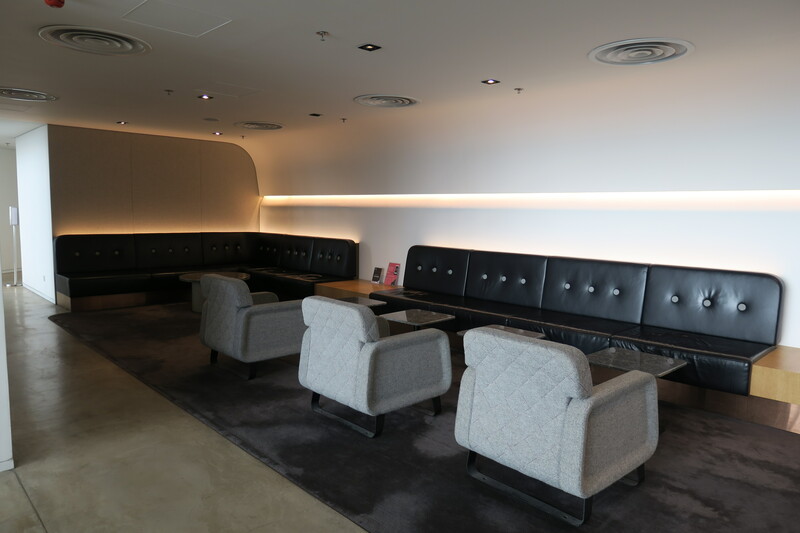 We’re definitely looking at one of the best outstation lounges in the world, though I didn’t have the same impression of this lounge as I did the last time. 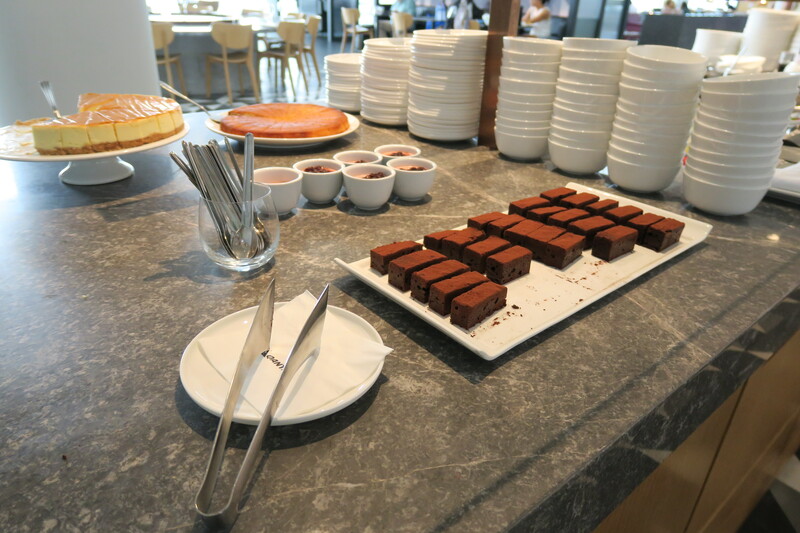 The Qantas Lounge Hong Kong is almost uselessly big, in the best way possible. 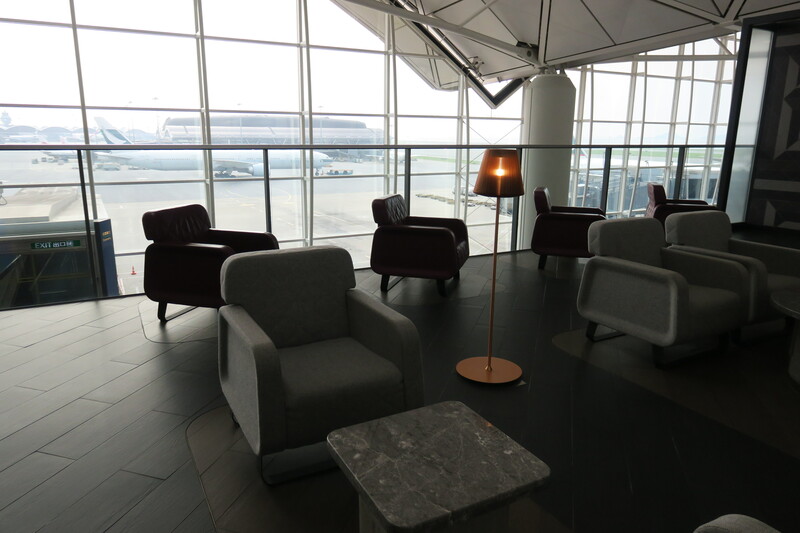 It’s run in a way that the lounge attendants would definitely be able to manage it at full capacity, though given that it’s bigger than some of Cathay Pacific’s lounges, I doubt they’ll ever have to deal with that, at least anytime soon. 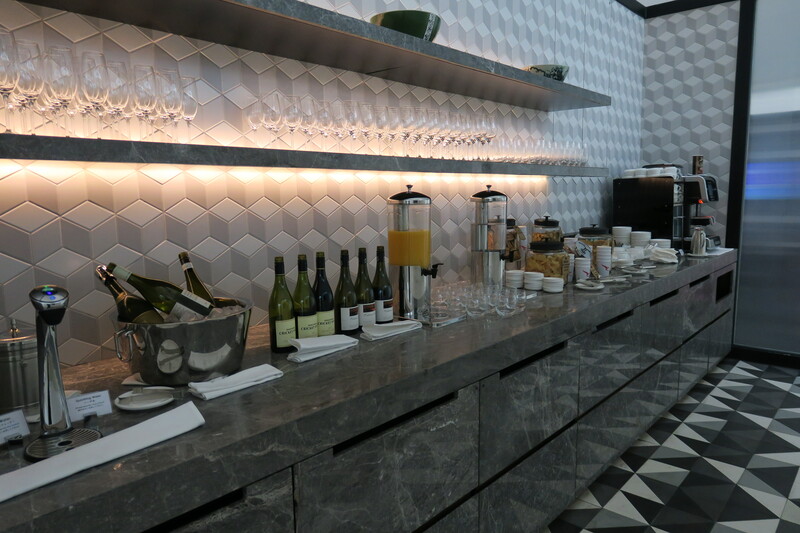 I definitely still prefer Cathay Pacific’s The Pier Business Class Lounge Hong Kong, with the exact same entry requirements, to this lounge, though admittedly we’re up to some stiff competition. This lounge won my favourite lounge in the world award of 2015, for good reason (the Pier only opened in June 2016). I’d call this lounge in the same league as the Swiss Business Class Lounge Zurich, Cathay Pacific Lounge Taipei, United Club Hong Kong and the Cathay Pacific The Bridge Lounge Hong Kong (admittedly I have a Hong Kong bias, but that’s because I’ve yet to visit many of the best lounges outside Hong Kong). What are some of your favourite lounges?